Larry the Pug December 20, 2013 What Would Larry Do? 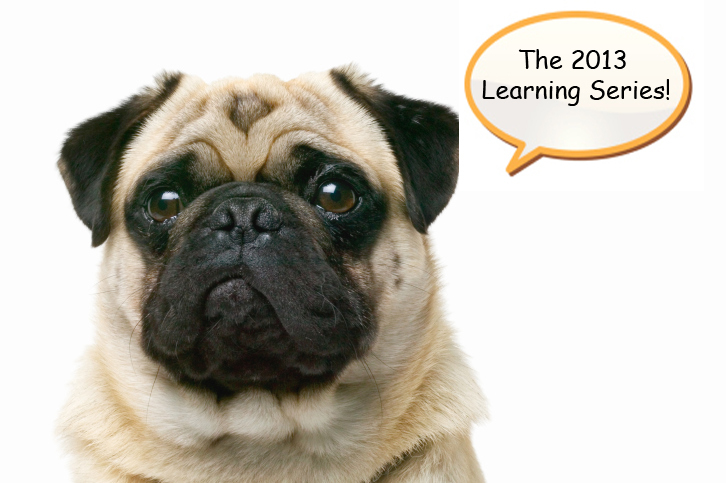 Larry's Favorite Things Day 8: The 2013 Learning Series! Sometimes, especially at this time of year, I love curling up on my dog bed next to the fireplace and catching up on ANCILE Learning Series presentations. If you haven’t managed to catch them all, or if you just want to watch some of them over again, I’ve provided links to the 2013 presentations below. We’ve even got a NEW micro demo for our uPerform Express customers! Organizing Content on Your uPerform Express Website In this short micro demo, learn how to customize your uPerform Express website to display different types of content on different areas of the page. Using uPerform Test Scripts for HP Quality Center Testing In this demonstration, learn about HP Quality Center, the benefits of using uPerform Test Scripts in conjunction with HP Quality Center, and how to create uPerform Test Scripts and export them to Quality Center. uPerform Publishing Settings Explained – Part Two: Courses, Guided Help, and Student Guides Learn about all the settings that affect the uPerform Course, Guided Help, and Student Guide outputs, including the most recent enhancements that were added in uPerform 5.
uPerform Publishing Settings Explained – Part One: Documents and Simulations Learn about all the settings that affect the output of your uPerform Simulations and Documents including the most recent enhancements that were added in uPerform 5. Overview of Building Your uPerform Website Hierarchy Watch this presentation to learn about the different methods you can use to build your uPerform website and enable your end users to quickly locate on-the job help. Integrating SAP Solution Manager with ANCILE uPerform – Performing Integration The demonstrations in this course go over all the steps required to integrate SAP Solution Manager with ANCILE uPerform. uPerform Glossary: More Than Just a Dictionary Learn about uPerform’s glossary functionality and best practices you can use whether you are just starting out with uPerform, considering adding glossary into the mix post uPerform implementation, or just looking for ways to improve your existing glossary processes. We have worked with members of ANCILE’s Professional Services team to develop this presentation based on their years of experience working with a variety of customers. Introduction to uPerform 5 Get the scoop on all the new functionality available in uPerform 5. Download this informative session that will demo the new features at a high level. Mind Mapping uPerform 5 Features Watch this quick video outlining some of the new features you can expect to see in uPerform 5! Using Audio with uPerform Content Ever wonder how to incorporate audio features in ANCILE uPerform Content? Watch this webinar for tips and tricks on how to use an external audio editor to record audio or blend with music. Custom Reporting: Taking Your Reports to the Next Level So you’ve rolled out ANCILE uPerform in your learning environment…maybe you are in the beginning stages of your training roll-out and need a way to track all the documentation that has been created, or you are in the stabilization phase and want to begin analysis of the content consumption to date. All this information and more is available at your fingertips! Please view this webinar to hear about several ways that you can use custom reporting in your organization to assist you in tracking and analyzing your uPerform data. ANCILE uAlign: Prioritize and Manage Corporate Communications ANCILE uAlign is a mobile corporate communications solution in the cloud ñ accessible via desktop workstation, laptop, smartphone, and tablet. ANCILE uAlign allows you to rapidly communicate key information and confirm receipt and comprehension. Download this webinar to learn how your team members can be always informed, always engaged, always productive Ö with ANCILE uAlign. Integrating SAP Solution Manager with ANCILE uPerform – Preparation Learn more about the benefits of integrating SAP Solution Manager with ANCILE uPerform, and what you need to know before you start your own integration. Custom Search Results on the End User Website The success of your training project depends on your end users being able to find the information they need as quickly and easily as possible. Have you ever wondered how you could customize your search results to add additional document information? If you have, this webinar is what you are looking for! In this Learning Series presentation, we will explain and demonstrate the exact steps you need to perform to add information like document description and transaction code to your end user search results. Larry's Favorite Things Day 7: ANCILE uAlign! Larry's Favorite Things Day 9: Connecting with You on Linked in!